Recommended Citation: Nelson, D K and C R Woratschek. Knowledge Mapping in a Not-For-Profit Firm: A Case Study. In The Proceedings of the Conference on Information Systems Applied Research 2009, v 2 (Washington DC): §3564. ISSN: 0000-0000. The ability to create, identify, capture, and share knowledge across an organization’s value chain is the goal of Knowledge Management (KM). This is especially true of tacit knowledge. The development and implementation of KM initiatives typically requires the substantial resources of large commercial enterprises such as people, time, and money. However, the very nature of the not-for-profit firm (particularly limited resources, informal processes, and staff turnover) results in weak knowledge sharing practices and frequent knowledge loss. How can not-for-profit firms understand how knowledge flows through their organization and, in turn, initiate strategies to capture tacit and explicit knowledge? 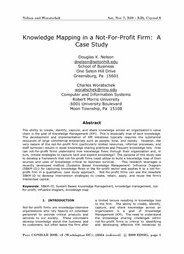 The purpose of this study was to develop a framework that not-for-profit firms could utilize to build a knowledge map of their sources and uses of knowledge critical to business survival. This research leverages a recently developed method (Systems Based Knowledge Management- Influence Diagram (SBKM-ID)) for capturing knowledge flows in the for-profit sector and applies it to a not-for-profit firm in a qualitative, case study approach. Not-for-profit firms can use the resultant SBKM-ID to develop intervention strategies to create, retain, apply, and reuse the firm’s intellectual capital.